Google announced today, December 6, 2016, that it has reached 2.6 GW of renewable energy purchased, putting the company on pace to reach 100 percent renewable energy in 2017. In its announcement, the company noted that renewable energy has both managed its carbon footprint and been good for business as the lowest cost option. Google has been a catalyst in the dramatic growth in renewable energy procurement among corporations, redefining the art of the possible by bringing significant renewable energy projects onto the same grid its data centers are powered from. 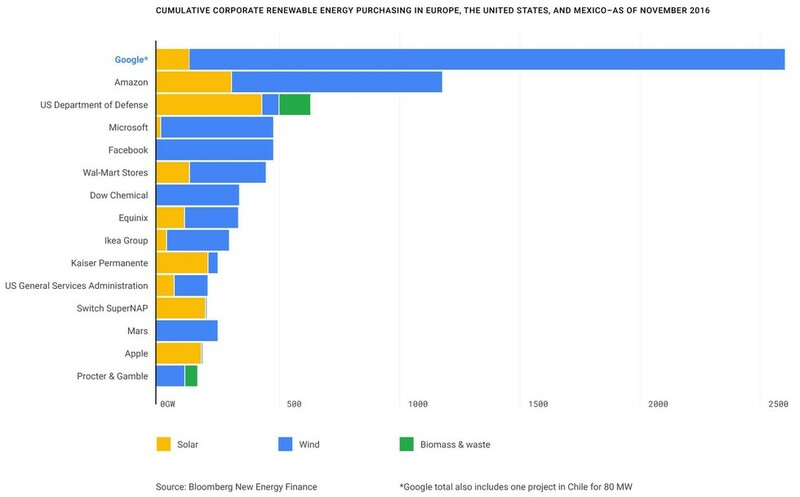 Google’s milestone of 2.6 GW of renewable energy purchased puts it well above what most corporations have done to drive renewable growth.